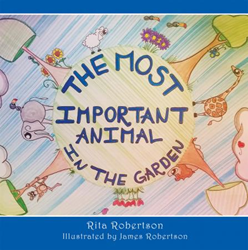 Within the pages of Rita Robertson’s new book, The Most Important Animal In The Garden, ($9.99, paperback, 9781498474368; $4.99, e-book, 9781498474375) young readers will find a delightful story about animals who get a visit from God. He instructs the animals to be kind, share their food, and show lots of love to each other in his temporary absence. A special little lamb journeys through the garden to help all of the other animals and set a good Christian example. However, the other animals would not accept the lamb’s help. A mean snake disrupts the group, takes charge and creates lies and doubt in the minds of the animals. Can the little lamb convince the other animals to ignore the lying snake? This book provides a wonderful lesson for children – a lesson to always trust in God. Adding to the charm of this story are full color illustrations – from little flowers and butterflies to the adorable animals – each hand sketched and delicately painted with watercolors by James Eagle Robertson. Rita Robertson is the mother of six children, the adoring grandmother of thirteen – and a great grandmother, too. She is a professional cake decorator, a Sunday school teacher and now a proud first time author. She believes God gave her this story to do great things in His name. One night while lying in bed, she was reading her bible and this story just entered into her thoughts. She grabbed a pen and paper and wrote the entire story. It’s a book to be treasured by children for years to come. Xulon Press, a division of Salem Media Group, is the world’s largest Christian self-publisher, with more than 15,000 titles published to date. Retailers may order The Most Important Animal In The Garden through Ingram Book Company and/or Spring Arbor Book Distributors. The book is available online through xulonpress.com/bookstore, amazon.com, and barnesandnoble.com.